This time last year, we saw Lenovo reworking the design of its classic ThinkPad laptop. Gone were the lid locking "sweater-catchers," the dedicated volume button and classic touchpad design. Everything became a bit more unibody, clean to look at and a bit more Apple MacBook Pro-ish. Then Haswell arrived and it became time to change out the internals as well. That's just what Lenovo has done, introducing the ThinkPad T440 at IDF 2013. The same chip that put the MacBook Air past the ten-hour mark in battery life powers this Windows 8 ultrabook. It's a bit chunky for an ultrabook, weighing 4lbs in its most basic configuration. Adding a touch display adds a bit of weight to it, as well as extra cost. It's still only 21mm at it's thickest point though. The MacBook Air might be thinner and lighter but the T440 has more ports. In addition to two USB 3.0 ports, there's an SD card slot, Ethernet and VGA. Storage options are big and functional as well, with the option of either a 512GB or 1TB SSD. The T440 can also get up 12GB of DDR3L, though we're not sure you'll need that much, since an i5 processor is your only option, not i7. RAM and storage aside, Lenovo is really bragging on 17-hours of battery life. Manufacturer claims are always a bit inflated, but you should know that to get this MacBook Air beating longevity, you'll have to pony up for a second cell. Not only does it cost more, it's awkwardly large. It's has a bulbous rounded bottom that makes the T440 sit at a propped up angle. We're not sure it'll be worth the hassle and cash, especially since the T440 already claims 12-hours with its normal battery setup. It actually has two batteries by default, one that's internal and another that's swappable. If you do decide to purchase extra batteries, they'll work on a number of the new T-series machines, basically all of them expect the T440P, so your IT department will get its money's worth. You can also hot swap the cells without shutting down, providing the internal battery still has some charge. Post-Haswell, you can't launch a premium ultrabook without offering jaw dropping battery. Unless you seriously cut the price it just won't be considered competitive. That was our biggest problem with the ThinkPad Helix convertible. Despite all it had going for it, the price was just too much to ask for with comparably priced machines lasting far longer. That oddly engorged battery reminds us of the flap on the back of the Helix; an unfortunate design flaw in exchange for better performance. Thankfully it's an option, not a necessity, as the T440 already claims very solid batter life. 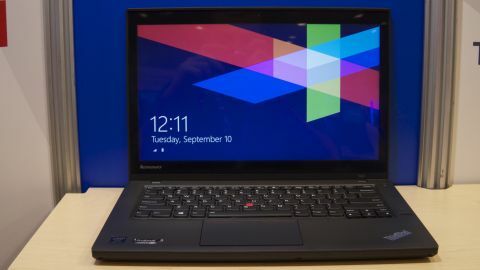 The ThinkPad name is still well respected, and deserves to be, but Lenovo has its work cut out for it in the ultrabook market. We're eager to see how this machine does in a our full review.